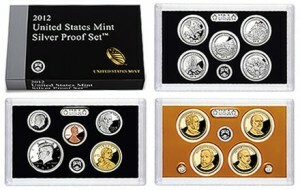 The U.S. Mint has not stated what coins will be within the 2012 Limited Edition Silver Proof Set. Those within the annual silver set, shown above, are a possibility. Collectors can expect a 2012 Limited Edition Silver Proof Set from the United States Mint. Listed earlier this week on the U.S. Mint’s product schedule but later pulled, the limited edition set will have a price tag of $149.95. When the set was posted on the Mint’s schedule, it had a release date of November 27, 2012. Given its disappearance, the release date remains in question. Pricing is based on a notice in the Federal Register that is signed by Richard Peterson, Acting U.S. Mint Director, and dated November, 9, 2012. The notice will become public on Monday, November 19, 2012. The notice does not include what silver coins will be packaged within the silver proof set, nor does it offer when it will be released. This is standard in notices that are released strictly for announcing product prices. And unfortunately, the U.S. Mint is yet to respond to questions posed Friday about the limited edition set, leaving its contents up for speculation. This year’s proof commemorative silver coins are all but ruled out. Combining different themed commemoratives within one set would be unusual at this point considering their limited sales time and prices of $54.95 for the 2012 Proof Infantry Silver Dollar and $54.95 for the Proof Star-Spangled Banner Silver Dollar. It seems more likely to expect a proof American Silver Eagle. Since the U.S. Mint indicated that it would not offer the 2012-S Reverse Proof American Silver Eagle outside of the 2012-S San Francisco Two-Coin Proof Set, the logical choice would be the 2012-S or 2012-W Proof American Silver Eagle. The former was also in the two-coin set. It is currently available within the Making American History Coin and Currency Set that comes with a unique $5 bill for $72.95. The 2012-W Silver Eagle is no longer available. Before it "sold out" this week with reported sales of 819,217 that are probably closer to 850,000, it was listed at $59.95. Also for considerations are the San Francisco minted 90% silver coins that come within the core annual Silver Proof Set. This year these include the five 2012-S America the Beautiful Quarters, the 2012-S Kennedy half-dollar and the 2012-S Roosevelt dime. Priced at $67.95, the 2012 Silver Proof Set also has non-silver proofs of the Lincoln cent, Jefferson nickel, 2012 Native American $1 coin and the four 2012 Presidential $1 coins. So, pull these clad coins out. Having them in a limited edition set would tarnish the brand and appeal of the annually issued set. That leaves one ‘S’ or one ‘W’ proof Silver Eagle and the 90% silver coins, which have a combined melt value of $75.46 based on Friday’s London Silver Fix price of $32.27 an ounce. And it presents a problem since the set with these proposed coins would cost nearly double its melt value. Also, price stacking does not match up well. If the 2012 Limited Edition Silver Proof Set includes a 2012 Proof American Silver Eagle that was $54.95 just days ago and the silver coins within the 2012 Silver Proof Set cost $67.95 to get, the total comes to $127.90. Would collectors pay $22 more just for packaging? Not many experienced collectors would. Unless the U.S. Mint has other combinations or some uniquely minted coins in the works, many collectors may be sour to both the idea of and the price for the 2012 Limited Edition Silver Proof Set. Oh goody! Just what we need, more re-packaged coins, we already have. Redundancy, redundancy, deja vu, all over again! Another way for the mint to increase the number of Commemoratives sold. A lesson to the collector, don’t buy highly priced TPG graded coins based on apparent low numbers in the census, at least not until such coins are completely pulled by the mint. Both 2012 Commemoratives, presently, have low census numbers and a price slightly less than the Medal of Honor. An increase in census will lower the value of these coins considerably. “President Barack Obama announced new nominations of key positions in his administration among them a new mint director. The chosen person is a woman, Bibiana Boerio who held various positions with Ford and Jaguar before entering the political sphere.” Mr. Peterson, your tenure as Acting Director is coming to an end. What will be your parting gift for the people you served? How about something that which would surpass the 2009 Ultra High Relief beyond measure which Mr. Moy spared no expense in executing? Can you top that as your last hurrah? You say you’re not up to this task? Can you perhaps execute an American Silver Eagle in a Ultra High Relief Reverse Proof? Even that is too much for you? Get Mr. Trump in here fast to fire Mr. Peterson post haste. Case closed. Who cares?…If the Mint doesn’t care enough to make mention to coin collectors what it is their selling, then I don’t care enough to even care to buy it. As I see it, as of late, no news is good news as far as the US Mints’ concern. And “no news” seems to be the route they’ve chosen to take when it comes to dealing with their customer. So again… why should we care? Before this should even matter to us, they obviously have a lot to learn about putting their customers first and foremost IMO. Thanks anyways Mike for caring enough to let us know that the Mint doesn’t care that we coin collectors don’t have a clue. It’s hard to guess what final production figures will be for any coin. Seems like if the Mint has excess inventory, they repackage the coins and raise prices. Speaking of which, on several of the burnished silver eagles I purchased from the Mint this year, they had put a sticker over the sticker from a previous year’s coin box. One sticker I peeled up revealed a sticker underneath from a 2008 coin. Recycling? Okay, but it looked cheap and cheesy to me. This is the very reason I purchase most coins for my collection from Canada , Australia , and the U.K. Our old U.S of A. has little creativity with the changing world of coin products . It is good to see that so many of you now “Get It” with regards to what the Mint has been trending lately. It has been all about the money and little to do with what collectors really want. I can’t wait to see the changes that Bibiana Boerio will implement after she ousts Peterson. Hopefully one of the first things she’ll do will be to survey the collecting public for all the aches and pains that Peterson brought on and for suggestions about remedies and improvements – but I’m not holding my breath. Let’s see I can buy the Annual Silver Proof Set and a Silver Proof ASE at current listed prices and that would cost me $127 OR buy this limited edition set for $150?????? Geez these people just have the worst concept of what a “limited edition” set is or should be!! Not even like what the Legacy Sets were. And then on top of it being the same old coins packaged differently, more expensive, then add in “expect delays in shipping”!!!!!! You really can’t make this stuff up but our government sure can!!! Ridiculous!!! Hey, if you were stupid enough to not get your proof silver eagle(s) before they reached the 850,000 mark then this is the only way you can get one. And besides this way you don’t have to deal with all those messy golden dollars and nickle and penny to get your silver set. Not only is it more expensive, it’s a dumb set of coins. The kind of coin set I would expect The Coin Vault to offer – breaking up a proof set to get just the silver pieces, adding the proof W eagle and calling it a silver proof set. Peterson probably stayed up late at night for weeks watching The Coin Vault before he came up with this idea to fleece more money from customers. Is there anybody left out there who could possibly think this is a set worth buying? They aren’t even individually encapsulated. The Coin V…? Are those crooks still in business? The Mint hired an outside agency to present customers with a survey of their service, quality, etc. Frankly, I told them how behind they were worldwide in variety, imagination, and presentation. Example: Anyone see ONE US Mint “Year Of the Dragon” coin for sale on their site? “Year Of The Snake?” The Dragon was (is) a heavy hitter for the Australian Mint monetarily speaking. Our mint can’t see this? The US Mint can’t do anything unless Congress tells it to. Which is why all they can do is come up with this lame limited edition silver proof set – because it fits within the current coinage laws. The survey results only provide ideas for dep dir Peterson to take to congress people to get them to pass new laws for new coins. Obviously he’s as incompetent at this task as he is at other tasks that running the mint requires of him.